The new CEO for the PNG Rugby Football League (PNGRFL) is Reatau Rau. The news of his appointment was made public today at a press conference at the Ela Beach Hotel in Port Moresby. 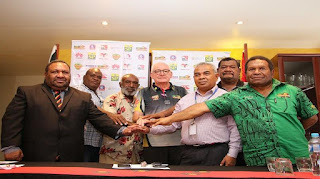 In attendance were the Directors from all four rugby league confederates (New Guinea Islands, Northern, Southern and Highlands) and PNGRFL board member, Graham Osborne. Chairman of the PNGRFL, Sandis Tsaka explained that board made the decision to appoint Rau after its fourth and final meeting last night. “The board appointed Reatau Rau following recommendations from its sub-committee in conjunction with the Human Resource company- Vanguard International,” said Tsaka. Tsaka said Vangaurd received 25 applications for the CEO post (8 were Papua New Guineans and 17 expatriates). The process took 3 weeks. “Vanguard using the criteria and the requirements of qualifications shortlisted 5 out of the 25 applicants (3 expatriates and 2 Papua New Guineans) and submitted to the PNGRFL board. “The sub- committee comprising of Graham Osborne, Southern Confederate Director, Gwaibo Mairi and Highlands Confederate Director, Joe Tokam worked with Vanguard to screen the shortlisted candidates and made their recommendations to the board this week,” said Tsaka. Rau’s position as treasurer of the PNGRFL will now be relinquished. His appointment as CEO is effective immediately. Rau, 52 from Vabukori village on the outskirts of Port Moresby holds a Bachelor’s Degree in Accountancy from the Queensland University of Technology in Australia. He also has a Diploma in Accountancy from the Divine Word Institute (now Divine Word University). Rau resigned this morning as the General Manager of Turumu Investments, part of the Brian Bell Group of Companies. He worked there for over 30 years. He was the treasurer of the PNGNRL intercity competition back in 2006 and in 2012 became Treasurer of the PNGRFL. “It wasn’t an easy decision to make. I thank the board for having the confidence in appointing me. There will be many challenges ahead especially with the Rugby League World Cup 2017. We have our domestic competitions to nurture and develop. There is also the women’s squad to prepare for the World Cup.